By 1830 a map of Westport indicates that there were five meetinghouses (two Quaker, two Baptist, one Methodist) and 13 schools (MHC 1981a). Improvements in the road network linked all main sections of town and provided overland access to Rhode Island to the west and Dartmouth and New Bedford to the east as well as Fall River to the north. 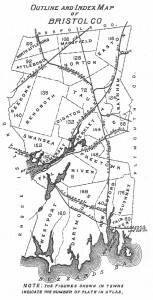 The decentralized settlement pattern that characterized Westport’s early development continued throughout the nineteenth century and was elaborated into a network of interconnected but separate villages. The major community distinctions included the Point, the Head, North Westport, South Westport, Central Village, the Harbor, Westport Factory, and Horseneck Beach, with each village comprising its own self-contained civic, residential, and commercial profile (Maiocco 1995). Westport’s population remained constant during this period, and only one percent of the population was listed as foreign-born in the 1855 census (MHC 1981a). The 1860 census listed Westport as having a total of 2,767 residents (Macomber and Wertz 1997:3). As a result, the settlement cores that had formed in earlier periods were generally maintained with little outward growth. By contrast, the early to mid-nineteenth century was marked as one the greatest economic expansion periods in the town’s history. Whaling was Westport’s primary economic endeavor throughout the period, accounting for much of the town’s prosperity. Barber (1839) noted that there were eight whalers operating out of Westport Point in the 1830s. By the 1830s, cod-fishing sloops refitted as coasting vessels hauled sperm oil to New York and returned to Westport with a wide variety of goods. By 1855, Westport was the home port for between 18 and 22 whaling ships, employing 462 men and netting $105,000 worth of sperm whale oil. With the discovery of petroleum, however, the whaling industry quickly died out. By 1865 there were only 10 whaling vessels still operating out of Westport and by 1875 there were no whaling operations recorded (MHC 1981a). 1871 map of Westport, MA (source: Beers 1871). Light industry also contributed to town growth, and included an expansion of the Westport Cotton Manufacturing Company. The company, begun in the first quarter of the century in a converted sawmill, grew into a complex of structures comprising mills, storehouses, and worker housing. Although plagued with financial difficulties throughout its operation, it was the single largest manufactory in Westport during the late nineteenth century, producing carpet-warp, twine, cotton batting, and wicking (Hutt 1924). In response to the decline in whaling, Westport returned to its agriculture emphasis. By 1875, 67 percent of working Westporters listed their occupation as “farmers,” and by 1895 the town was the fourth largest supplier of agricultural products in Massachusetts, at $523,460 per year (MAAC 1895). The Baker and Gifford families also started cranberry operations near the coast (Beers 1871). Fishing remained a mainstay of the Westport economy. Cod was harvested for sale to neighboring towns, menhaden was used to fertilize agricultural fields, and a corollary industry of saltworks developed at the Point, extracting salt from the brine used to preserve the fish (Smith et al. 1976). Windmills provided much of the power needed to move saltwater through the system of vats and drying racks (N. Judson, personal communication 2003). The growth of the agricultural and light industrial base of Westport was enhanced by the construction of rail lines through the town. The Watuppa Branch of the Old Colony Railroad passed through the northern portion of town in 1872. This transportation network allowed Westport farmers, in particular, to expediently get their products to expanding and profitable urban markets. 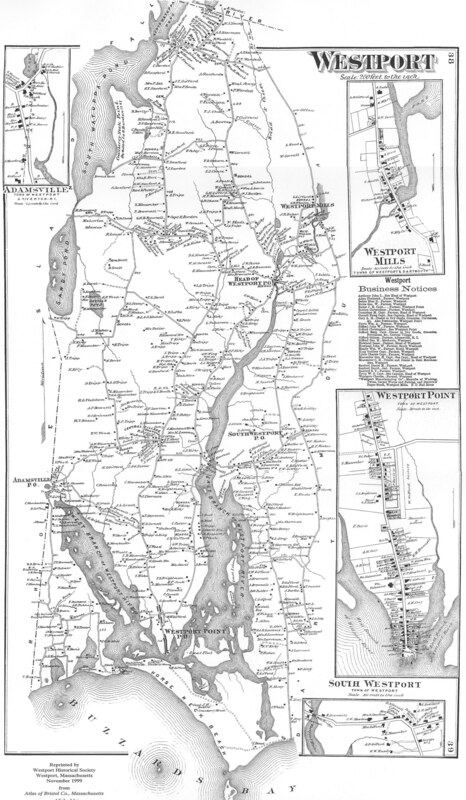 In 1894, the Dartmouth and Westport Street Railway linked Westport with New Bedford and Fall River. Roadways were also improved during this period to accommodate increased traffic into and out of Westport, and the New Fall River Road (Route 6) was built. Summer tourism began to attract people to coastal sections of Westport during the 1870s. Wealthy New Bedford merchants employed servants, including immigrants (N. Judson, personal communication 2003). Westport Point was connected to Horseneck Beach by a bridge in 1893 and became a popular summer vacation spot, with small cabins and grander summer homes sprouting up across the shoreline and protected inland bays (Ellis 1892). Rail lines in nineteenth-century Bristol County (source: Walling 1895). Westport’s population increased slightly between 1870 and 1880, declined slightly between 1880 and 1890, and then began a slow increase through the turn of the century. The number of immigrants also increased during this period from 11 percent of the total population in 1883 to 20 percent in 1915. Around the turn of the century, Westport saw an influx of Portuguese (and particularly Azorean) families who were drawn to the area by relatively inexpensive farmland. French Canadian families were already present in the Westport Factory area but continued to move into Westport from the New Bedford area, with a concentrated settlement around the Narrows (Maiocco 1995:2). Historian D. Hamilton Hurd described Westport at the end of the Late Industrial Period for his History of Bristol County (1883). He noted that there were five post offices, corresponding to the main settlement areas of North Westport, Westport, South Westport, Central Village and Westport Point. As the twentieth century approached, the town was moving from its height as a commercial and industrial power to a more residential area focused on agriculture and village community.